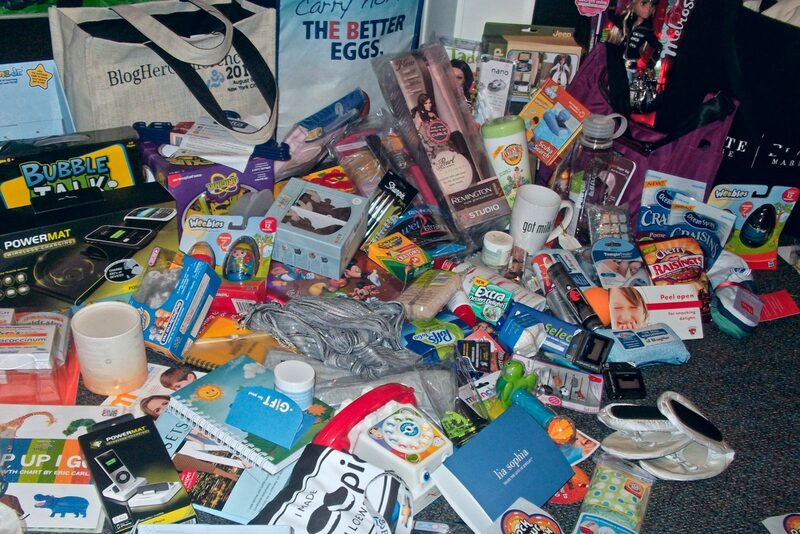 The contents of single SWAG bag from a recent Blog Her conference. Historically, events have been one of the great offenders in the categories of reducing, reusing, and recycling. Need to feed a giant crowd? Have more than you need on hand, then throw it out when all is said and done. Want to make cleanup a breeze? Use disposable products and toss them in the garbage. And those tablecloths? Just buy them new. Why bother tracking down used ones? Obviously, the pursuit of efficiency hasn’t been very sustainable. Landfills are surely full of party products from years gone by. But the world has gotten greener in the last couple of decades. Global warming has made industries think twice about their waste, and the event industry is no exception. So now, a few realistic ways to improve the sustainability of your next event. Studies have shown that a single conference participant produces 0.64 kg of garbage each day of an event. Hosting two thousand people for a 4-day training? That’s 5.6 tons of garbage. And the biggest contributor to the load are disposable cups, plates, and utensils. Swapping your styrofoam cups for recyclable or compostable materials is a great place to start. But if attendees toss them in the garbage anyway, you’re out of luck. And that brings us to our next point. A surefire way to encourage recycling is making it easy while making trash difficult. This is achievable is all of your materials are either recyclable or compostable. Then you can have a single type of trash can with a poster showing all of the plates, cups, and utensils it can handle. And for those one-off items that an attendee brought with them, a tiny trash can be available for those who must use the landfill. Another major contributor to event waste is excess food. And it’s understandable. After all, no one wants to be the one to tell guests you’ve run out of food. And the FDA has strict guidelines about how long food can sit out before it must be tossed. For event managers, this typically means that their room temperature taco bar can’t be donated to a local food bank. The solution: call a local soup kitchen and ask what you could do to ensure the safety of your leftovers. Usually, it all comes down to temperature. Believe it or not, emissions are a big problem with big events. A virtual pass not only saves attendees time, but the avoided airplane or automobile emissions can impact the Earth as well. It’s the last day of the networking conference, and you’re packing your stuffed bags to catch your flight. There it is, staring you in the face: the conference SWAG bag. Pens, keychains, and beer coozies. If you’re like many attendees, you commit the green sin, tossing the bag in the hotel trash can. What a waste! Instead, make a bin for collecting unwanted SWAG bag items. Then donate the unused items to local schools. Pens may be commonplace to you, but to someone else, they’ll be a gift.